In our digitally driven, globally connected world, your network can make or break your business. The use of mobile devices and applications across diverse physical, virtual and cloud infrastructure is skyrocketing, placing rapidly escalating demands on your network resources. With Infoblox Next Level Networking, you gain a platform that provides all the capabilities you need to more easily secure, ensure reliability, and automate your network—creating a network that’s not just an asset but a true differentiator. Gain greater control over all of your network assets whether they’re on site, in your datacenter, or in private and public clouds. Achieve the Tier 1 network availability, agility, and single-pane-of-glass visibility your business demands. With Infoblox, you can extend your capabilities and seize new opportunities enabled through cloud innovation—and without disruption. 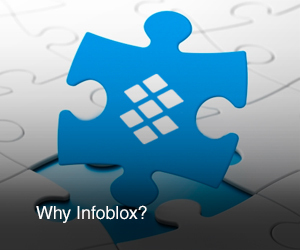 With Infoblox, you can automate essential tasks that boost availability, performance, and efficiency across devices, applications, and infrastructure, while achieving costs savings of as much as $1M a year. Automatically provision network assets. proactively monitor and analyze network configurations, automate network changes, and simplify policy enforcement and auditing. Want to See How Infoblox Next Level Networking Can Work for You?